Severe drought in 2018 affected hundreds of thousands of people, from Central Asia to Central America, from the Sahel to North Korea. In Afghanistan, drought displaced nearly as many people as conflict in 2018, and the worst impacts may be yet to come. In Somalia, food shortages from drought and floods combined with conflict to force people from their homes. In low-lying Pacific nations, governments are reluctantly making worst-case contingency plans to permanently move entire communities – a handful of managed relocations are already quietly underway. World Bank research predicts climate change could force 143 million people by 2050 to migrate within their own countries in sub-Saharan Africa, South Asia, and Latin America. This year could offer an early climate test for the aid sector. The UN’s meteorological agency says there is a 75-80 percent chance of a weak El Niño event developing by February, which could combine with long-term climate change to destabilise already volatile rainfall and temperature patterns around the world. It’s a threat multiplier that could sharpen food insecurity and exacerbate existing emergencies. Recently, the Internal Displacement Monitoring Centre estimated drought-linked displacement for the first time in four countries, tallying 1.3 million people in Burundi, Ethiopia, Madagascar, and Somalia. These numbers, researchers said, “suggest that the true scale of displacement far exceeds available estimates”. Attributing climate change to specific disasters is an emerging science, though, and definitively linking climate change to specific displacement is even more difficult. 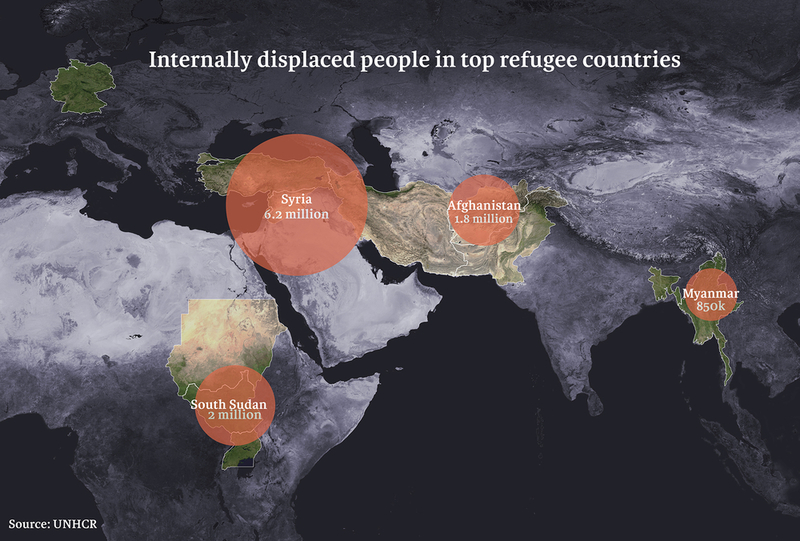 Uncertainties in estimating displacement are a “major blind spot” for the aid sector: without knowing how many people could lose their homes and livelihoods, planning humanitarian responses and enacting responsive policies becomes more problematic. Nearly eight years since the uprising against al-Assad began, his government appears to be closing in on victory, both on the battlefield and in the political arena: rebel pockets in the capital Damascus have been defeated, and the Arab League is reportedly looking to readmit Syria to its ranks, after expelling it for violent repression of demonstrators in 2011. But the war is not over yet: there are still an estimated three million people in the rebel-held northwest around Idlib province, which is only quiet due to a Turkey-Russia deal. The US announcement that it will pull its troops out of Syria at some point could mean a bloody power struggle in the northeast, where Turkey, Kurdish fighters, government forces, and the remnants of so-called Islamic State all have an interest. As donors, al-Assad, and outside powers all look to get a foothold in Syria’s future, the mix of potential chaos and pockets of calm – including areas run by groups designated as terrorists by Western countries – will make it even harder to deliver neutral aid, based on need alone, to all Syrians. That aid includes emergency needs like food, shelter, and healthcare, as well as the increasingly controversial issue of reconstruction during wartime. If you think aid has already been manipulated in Syria, there’s plenty more of that to come. The UN no longer considers any part of Syria besieged, but 45,000 people are trapped in a no man’s land between Syrian government front lines and the border with Jordan. With aid deliveries few and far between, this makeshift camp is a reminder of ongoing blockages in the aid effort. From Afghanistan and Syria to the Central African Republic and South Sudan, violence is pushing international aid groups to rethink their operations in conflict areas, as once-accepted norms of providing humanitarian access safely to aid workers are repeatedly flouted. Faced with threats to humanitarian staff and shrinking access, international aid groups are relying more and more on local responders, but those responders don’t always have the resources to stay safe. In 2017, nearly half of the 300 aid workers killed, kidnapped, or wounded on the job worked for local non-governmental organisations – a sharp rise reflecting “near-universal reliance” on local staff in the riskiest areas, according to the Aid Worker Security Database. Despite taking on more of the risk, local groups say they don’t always have the means to stay safe. Strapped for cash and commonly unable to access direct donor funding, local NGOs frequently have no alternative but to accept short-term sub-grants. Funding and project plans often trickle down without the support to strengthen security and manage the risks. The trend stretches beyond conflict zones: the wider humanitarian sector has promised to “localise” aid – empowering local communities, NGOs, and authorities to lead their own responses – but local organisations say they’re often treated as sub-contractors rather than equal partners. Is there a solution? Local aid organisations are pushing for direct, longer-term funding and a greater share of the resources that could help their staff manage the risks. But promised reforms have been slow across the aid sector, let alone in conflict zones. There’s a common assumption that local staff and organisations face fewer risks in insecure areas, precisely because they are local. But local aid workers have always carried the greatest burden in violent humanitarian emergencies: roughly nine of every 10 aid workers attacked are local staff. For many years, Abiy, who took office in April 2018, was an officer in the vast national intelligence apparatus. Since taking power, he has moved boldly to rein in that same security establishment, end a cold war with Eritrea, and even install a former political prisoner (jailed by his own party in 2005) to run the country’s elections. The developments are breathtaking – but a little scary. Inter-communal tensions have been flaring in Ethiopia since 2017: violent clashes over land and resources left 1.4 million displaced in 2018 alone. In addition, about four million are on welfare schemes every year, and some eight million more have needed help with basic food in the last two years thanks to poor weather. Ethiopia relies on rain-fed agriculture and is precariously low on foreign exchange. Regions (and sub-regions) are demanding more autonomy, the ruling political coalition is under strain, and a military old guard feels cornered. Ethiopia hosts more than 900,000 refugees, mainly from South Sudan, Somalia, and Eritrea. It has a military presence in Somalia, including part of a flagging African Union force fighting al-Shabab extremists. It is also the top contributor of troops to UN peacekeeping. Aid agencies and analysts say it’s not peace and readiness driving returns, but political considerations and poor conditions in host countries. And returns are often voluntary in name only. Refugees can have their right to stay revoked or be offered incentives to return, but in many cases they feel compelled to head back to danger for family reunification or because they have little prospect of integration (access to housing, schools, work, and healthcare) elsewhere. The UN refugee agency is forecasting 250,000 Syrians to return to their country in 2019. But not all of Syria’s 5.6 million refugees or 6.2 million IDPs want to go back. For those who do return, obstacles can include a lack of documentation confirming identity and property ownership, few or no basic services, and the risk of unexploded ordnance – not to mention forced conscription and the ongoing war. In South Sudan, where a fragile peace deal is encouraging returns, returnees also face extreme food insecurity and few functioning markets in one of the world’s most underdeveloped economies. A recent report highlighted a dearth of planning “to ensure a continuation of protection and life-saving aid services in potential areas of returns”. 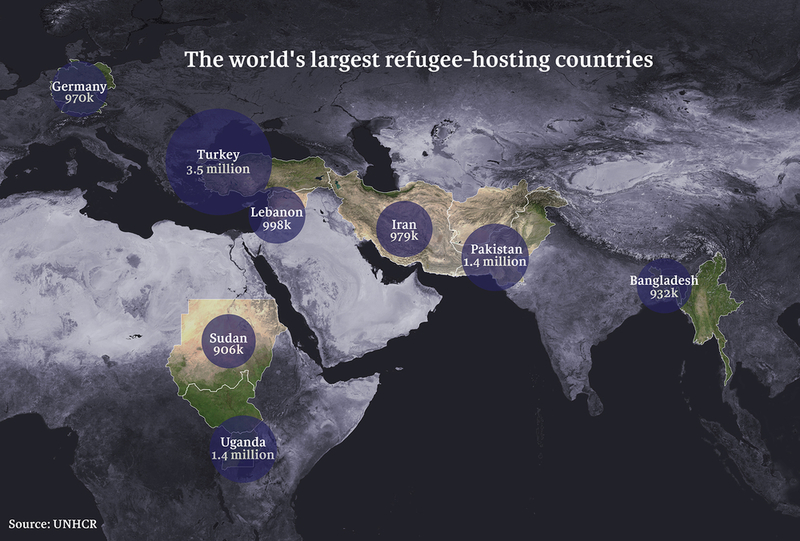 Afghans fleeing war are now finding it harder to find refuge abroad, and hundreds of thousands of refugees in Pakistan and Iran face increasing pressure to return to a country still mired in conflict, with safe land and job opportunities in short supply. Neighbouring countries are also reportedly preparing for a fresh refugee influx linked to US withdrawal plans. Meanwhile, Rohingya in Bangladesh remain in a stateless limbo, having been denied citizenship in their home country of Myanmar. Attempts to kickstart repatriations floundered in 2018. But Bangladesh says the nearly one million Rohingya refugees on its soil must one day return home, and no one really knows what 2019 will bring. The UN abides by the legal principle of non-refoulement and has criteria for refugee returns: they mustn’t be rushed or premature and they must be voluntary and sustainable. We’ll be watching to see if this holds true over the next 12 months. Despite significant medical advances and modern organisational procedures that can help tackle outbreaks almost as soon as they occur, epidemics and infectious diseases are still among the most common killers in many countries caught up in conflicts or natural disasters. In places like South Sudan, with weak healthcare systems weakened further by war, resources are unavailable to deal with even treatable diseases like malaria. As a result, thousands of lives are unnecessarily lost. In countries gripped by protracted conflict, like the Central African Republic and the Democratic Republic of Congo, years of fighting have decimated health facilities. The presence of armed groups often thwarts attempts to reach patients, preventing measles or yellow fever vaccination campaigns for instance and, in 2018, enabling Ebola to spread in eastern Congo. In countries in all-out war, like Syria and Yemen, bombs and attacks have left hospitals in ruins, while the destruction of water and sanitation infrastructure has made it easy for diseases like cholera to spread. While outbreaks of disease are a medical concern, it is the larger structural and political issues that allow them to thrive and recur. The combination of weak systems, flaws in prevention efforts, ineffective response capabilities, and ongoing conflict is making healthcare a casualty of crisis and a huge concern for humanitarian workers going into 2019. South Sudan and the DRC are two of the world's largest humanitarian crises, displacing almost 10 million people between them. The roots of conflict and the historical backdrop in each country are very different, but civilians in both are desperately hoping that political change in 2019 will yield more peaceful conditions on the ground. In Congo, long-delayed elections to replace President Joseph Kabila – in power since 2001 – finally took place on 30 December. The polls, although relatively peaceful, were marred by reports of widespread irregularities, including broken voting machines and missing voter rolls. Other areas (largely opposition strongholds) were excluded from the vote entirely, the government citing instability and Ebola as reasons for the decision. This sparked violent street protests, as opposition figures alleged the move was a ploy by Kabila to manipulate the polls and ensure his party retains power (more than one million registered voters were excluded). If elections aren’t viewed as free and fair, tensions could escalate – as they have in the past – moving political violence to the top of Congo's extensive list of challenges. The country is in the midst of its worst Ebola outbreak; armed attacks continue in the central and eastern regions, including Ebola-affected North Kivu and Ituri; and intercommunal conflict, displacement, and severe food insecurity have left almost 13 million people in need of assistance. In South Sudan, where half a decade of war has devastated the country, yet another peace agreement was signed between the warring parties in September. While some see signs of hope that this new truce will hold, ushering in the return of refugees and the rebuilding of the country, many analysts fear more of the same, as the new accord is not that different from the one drafted in 2015 that fell apart soon after being signed. Although violence has reduced in some parts of the country, armed groups are still active; IDPs are not yet rushing home as security and basic social services are lacking; and many remain suspicious of the motivations of the politicians whose in-fighting triggered the crisis. The extent of displacement and food insecurity in South Sudan and the large number of conflicts in Congo amount to a scale of humanitarian crisis only matched by Syria and Yemen. It will take more than ballot sheets and paper pacts to turn lives around, although it’s a start. And Ebola could become an even bigger problem, especially if it spreads from Congo to South Sudan. The scope of counter-terrorism legislation has not widened dramatically – although the UK may add new legal provisions – but the machinery of enforcement has matured. Risk is thus being pushed down to implementing agencies, observers say. Donors’ compliance demands are getting heavier, and that’s making it harder to help people who, whatever their views, just happen to live where sanctioned groups are in control – from Somalia to Palestine to Syria. Whatever the regulations, NGOs still need to move funds and engage in dialogue with whichever authority holds sway. NGO advocates say they can’t possibly check every aid recipient’s family for members who are militants, but they fear that’s where things are heading. Investigators attached to USAID told IRIN they don’t pursue petty cases but have a duty to stop large-scale criminal fraud in taxpayer-funded aid programmes. But even minor infractions – like who attends a training session or public event – can put an aid agency on the wrong side of sweeping counter-terrorism laws. Working in Gaza, for example, is a US legal minefield, as the de facto authority that runs hospitals and schools, Hamas, is a designated terrorist group. Several US investigations are expected to become public in 2019, which may impact more NGOs. Some aid agencies may shut up shop in the most difficult areas. Donors may choose to transfer more funding through large UN agencies or international banks to avoid the enforcement headaches of dealing with smaller NGOs with less legal clout. Getting help to Palestinians and parts of Syria will be particularly difficult. In Nigeria, the Islamic State of West Africa Province (a Boko Haram splinter group) is now the deadliest IS franchise – seizing towns and racking up more killings in November than IS-linked groups in Syria and Iraq. Security has also worsened due to Islamist attacks in several other countries in recent months, noticeably in Mali and Burkina Faso. Meanwhile, governments from North Africa to South Africa appear unprepared for the potential security impact of the return of citizens who fought with IS in Syria and Iraq. Extremist groups operate in Egypt and Libya, and across a belt of Sahelian countries, including Burkina Faso, Cameroon, Mali, Niger, and Nigeria. In Somalia they control a large swathe of territory, threatening other countries in East Africa, while a new militant group has emerged in the southern African nation of Mozambique. Somalia and Mali have been the hubs of longstanding jihadist insurgencies, which have also lent support to like-minded groups in neighbouring countries, such as Burkina Faso. In the Sahel, violent events linked to militant Islamist groups tripled in 2018. All this prevents governments from delivering public goods and services to affected regions, robbing them of an effective riposte to the ideological challenge posed by the militants, who portray their rebellions in terms of justice and righteousness. African armies have proven unprepared to deal with these guerrilla forces. Governments continue to reach for military solutions, backed by their Western partners. At the same time, an over-militarised response risks fuelling support for the extremist cause as a consequence of human rights abuses committed by the security forces and measures that restrict people’s livelihoods. The sheer scale of Yemen’s humanitarian catastrophe is staggering: the figure for those in need (above) represents 80 percent of the country’s population, and 2018 also saw economic collapse, a renewed cholera outbreak, and a further slide towards famine. The conflict sometimes seems intractable, and so it was to the surprise of many observers that UN-led talks on Yemen bore some fruit at the end of the year, when two delegations in Stockholm agreed to a ceasefire in the key port city of Hodeidah, among other measures. But Yemen’s conflict has more than two sides; it’s really a fractured web of alliances at local, national, and international levels so complicated that few people really understand it, and the main negotiating parties don’t always control the troops fighting on the ground. As 2019 starts, a UN observer mission is in Hodeidah and more talks are scheduled. But if those with a place at the negotiating table do agree to end the larger war without addressing local grievances, there’s a real risk that a series of smaller conflicts will leave civilians in the line of fire and prevent them from getting the help they desperately need. The UN is appealing for $4 billion to help 15 million Yemenis in 2019 – that’s the most it has ever requested for one country. The needs are huge, and even though the world is finally paying some attention to Yemen, the violence, hunger, and death may not end even if the war does.